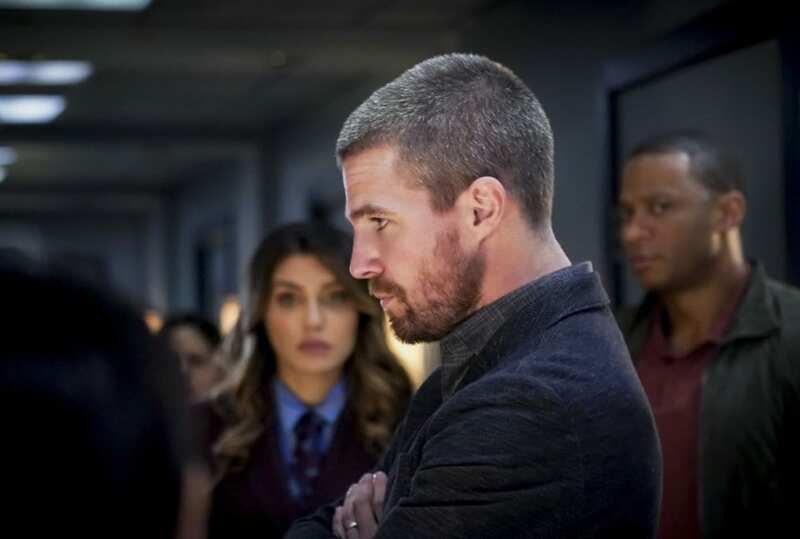 The CW’s Emerald Archer returned this week with a titular episode, “Emerald Archer,” in which Oliver has agreed to have a reporter and her camera crew follow him around to produce a documentary. The goal: to shine a brighter, more positive light on vigilantism in a Star City in light of anti-vigilante laws presently on the books. The earlier scenes of “Emerald Archer” showcase numerous on-camera interviews with former members of Team Arrow, and in some cases comparative flashback interviews to juxtapose their testimonies prior to Ollie’s identity reveal with those now. We even see a flashback of Thea Queen being interviewed in this portion, as well as a cameo by our favorite speedy Central City CSI. This song and dance routine is all for the purpose of setting up the main theme of the episode: should vigilantes be allowed to operate within Star City? While we may believe the answer to be a definitive “yes,” Mayor Pollard, who was the very person to introduce the legislation, isn’t convinced, nor is she pleased with Oliver’s present partnership with the Star City Police Department (a sentiment still shared by a handful of cops). Also in this episode, Oliver’s son William returns, although he is far from happy to be home. Not only does he show an active coldness towards Felicity, who tries to have a heart-to-heart “mom talk” with him, but he also sneaks out of the apartment and visits Zoe at Rene’s home (an interaction that I personally found comedic given Rene’s very fatherly reaction to a boy coming over to hang out with his daughter). Moreover, Felicity manages to pry the truth out of him that he had been expelled from his boarding school. As I said, the members of Team Arrow had, for the most part, been on far-flung roads from one another this season, so their interactions in “Emerald Archer,” given varying levels and directions of character development, is curious to watch. Oddly enough, John shows the most desire to put the band back together, as it were, while Oliver is decidedly against the notion. It isn’t until his friends convince him that the best way to draw out this mask collector is during a live debate he’s to have with Mayor Pollard over the merits of vigilantism, that Oliver agrees to rechristen Team Arrow. Mayor Pollard remains unlikable as ever, and that’s a good thing – that’s the entire point behind her character, as even upon Team Arrow’s saving several officers and the documentary’s camera crew, she orders them to be apprehended. What follows is Dinah and Oliver both offering to turn themselves in (Dinah having broken her metahuman cover and used her Canary Cry during the raid to capture Chimera) if the Mayor wants to follow through on arresting the members of their team. Fans have had an off-and-on relationship with Dinah over the last couple of seasons, but she shows true conviction and devotion to her friends in this moment, something that catches even Pollard’s attention. Pollard responds in kind by offering that Dinah and Ollie retain their present positions and, in addition, bestows official Star City Police Department badges to the other members of their team so that they too may operate within the boundaries of the law and in tandem with the SCPD. And Mayor Pollard’s heart grew three sizes that day. “Emerald Archer” brings with it some really cool action sequences, not so much with regards to the fight choreography (which is remarkably average for Arrow, for the most part), but rather the camera work. Much of “Emerald Archer” was shot via a documentary footage format, which lends itself well to the goings on of the episode. It also brings a splendid sense of drama to the action shots. What would be a simple dive forward to avoid fire is transformed into a dramatic leap, with a rotating camera somersaulting in unison. I mentioned that the fight choreography is by and large average; however, one particular sequence, when Team Arrow strategically gangs up on Chimera in order to shut him down (quite literally; his suit is mechanized and virtually impervious to damage otherwise), is an excellent use of each team member’s unique abilities and training. Oddly enough, Oliver regularly gets his posterior handed to him in one-on-one fights against the crazed fan – time to get back into the gym, Ollie; you’re showing your age. One final bit about William: I hated him in “Emerald Archer.” Perhaps I’m a product of a different family, but the blatant, demanding disrespect he shows towards Felicity early on is appalling, to put it lightly. In many ways, it reminded me of earlier episodes of The Flash this season, wherein Nora was rude and dismissive towards Iris. Show your mom respect, kids. Arrow - Season 7 Episode 12 "Emerald Archer"
Team Arrow coming back together, strong performances all around and a distinct lack of CW drama, along with great action sequences and interesting developments throughout, set "Emerald Archer" high on the episode list for this season.